If you’re reading this, it is likely you have experienced the feeling that no one really understands what you’re going through, even the people closest to you. These feelings are common for people living with chronic illness and can contribute to adverse health outcomes. 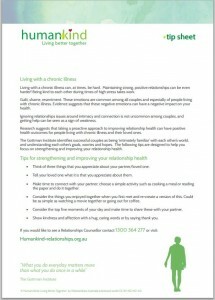 Good relationship health is fundamental to overall wellbeing and working to improve your most important relationships can have positive health outcomes. All couples experience hard times to some degree and research shows people in happy, satisfied relationships, have better health outcomes than people living in unhappy marriages (Gottman, 1999, p4). The opposite is also true, that bad relationships are bad for you. Liz, in her late 50’s, has been living with chronic illness for the past 10 years. Forced into retirement early, Liz shares how relationship counselling has helped her and her long term partner to keep their relationship strong. For additional resources, please visit our ‘My Client‘ Page.